Trigger warning: this blog may be TMI for some people, so don’t read on if you are easily offended. Much like role-play, the educationalists favourite tool, is superficial and a poor replica of the complexity of any real life scenario, sleeping on cardboard teaches me NOTHING about really being homeless. 1. Laundry – talking with my 6-year old daughter about what to take for this evening, she stated I should not take my freshly washed clothes. ‘No!’ I protested. I am constantly paranoid about being clean and pleasant smelling. At the end of a second day in the same clothes, I start to feel uncomfortable. IMAGINE after one week, after two. What would that do to my self esteem, my comfort in being near other people? Then I picture the equipment, consumables and money that goes into being able to DO my laundry and appreciate that being home-less is being washing-machine less. 2. Make-up – I’ve stripped off my make-up, otherwise my eyes would be welded shut with Gorilla-Glue-TM-strength mascara. The result is I look half dead, unrecognisable, you would cross the street to avoid me. Again, I think of the effect on my self esteem. I’m surrounded by images of what a ‘normal’ woman should look like – beautiful whilst cleaning bathrooms, changing nappies, cooking dinner – on buses, on TVs, and posters. When women are define by their looks, not having access to beauty products might, again, effect self esteem. 3. Just crawled into my sleeping bag. It would appear bubble wrap and cardboard-on-tiles, in no way, a mattress make. I predict cramp, back-ache and pins-and-needles this night. 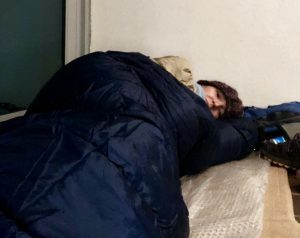 IMAGINE then, what it would be like to sleep rough every night with a cold, aches-and-pains from the flu, vomiting and diarrhoea, or a long- term chronic illness. Then consider how much more likely a poor diet, substance abuse, lack of washing facilities, sleeping on concrete, would make catching or exacerbating these illnesses. What would that do for my mental and physical health? This of course leads me to think about doctors and hospitals – but could a person without an address access good quality – long-term – care to help them recover? 4. Lastly, before I go to sleep, I must make the cold (despite the unseasonably decent weather) trip to the toilets. Because this is a role-play, a staged event, I have close access to decent loos. I don’t need to beg or plead or sneak in to use them. Which is good, because (wait for the TMI) I am on my period. I state this for two reasons. First, a woman’s period should be as easy, normal, shame-free to talk about as coughing. In fact more so – coughing is a sign of illness, whereas menstruating is a sign of health and vitality. It’s a good thing, not a ‘curse’. Second, think of period poverty, think of a woman not having a supply of the ‘luxury’ items known as Tampons. Think of how that is cast as shameful and disgusting in society. Yet again, think of the effect on self-esteem. I am so very, very privileged. The vast majority of society are more privileged than people on the streets. And as people who are facing the toughest, most fundamental, of challenges – that of no shelter, no food, no warmth, poor physical and mental health, no resources – they deserve society’s help and our help. We are failing them, is it surprising that many embrace substance abuse as a way out, at least temporarily. 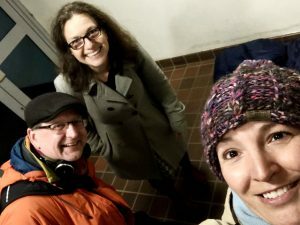 Thus my foray into experiential learning and superficial role-play has allowed me time and space, and concrete practicalities to help me consider what being homeless might be like. I can never know, unless, God forbid, that happens to me. But I know more than I did when I first signed up for this. My awareness has been raised. Perhaps those educationalists are on to something. 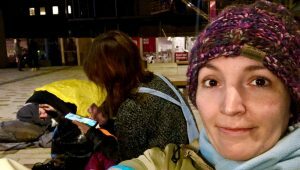 UPDATE: after a surprisingly good night sleep – due to being safe, having food and facilities, a favourably warm night, amongst friendly people – I can conclude that this experience is nothing like the demoralising, rejection, layering upon major life issues that many people who find themselves on the streets must experience. About the only similarity was Sleeping-On-Cardboard.